My wife was relating a story she heard on a podcast with Simon Sinek, the author and leadership consultant. He was talking about examples of enlightened management, and he mentioned a manufacturing company that refused to lay off employees during a downturn. The company’s somewhat strange name, “Barry-Wehmiller,” caught my attention. I went to get my copy of Everybody Matters, written by their CEO, and started reading. Barry-Wehmiller is a 130-year old manufacturing company, made up of 11,000 employees who design and build machines that do things most of us never think about, like injecting shampoo into bottles, or making toothpaste boxes. That might not sound particularly interesting, but their financial performance is on par with Warren Buffet’s. More importantly, when it comes to how their employees relate to each other and to the work they do, Everybody Matters serves as an inspiring example of the way things could be. The answer was in how Bob Chapman related to employees. When he visited a factory, he would ask questions - and he would listen to the answers. What he heard often gave him ideas for experiments to try and changes to make. Then he would ask more questions. How do you feel about these programs? What are we doing that doesn’t match up to what we say? Workers were understandably skeptical. One factory worked asked, “If I tell you the truth, will I still have a job tomorrow?” Then he made this observation. Why is it when they go to the office and I go into the plant, we are treated completely differently? If the lady in accounting wanted to call home and see if her kids made it to school, she could just pick up the phone and call; I had to wait until I had a break and then use a pay phone. If I have a doctor’s appointment, I have to get my supervisor to sign off on my card and I get docked for the time; she just goes to her appointment. I had to wait for the break bell to get a cup of coffee or to use the bathroom. The CEO was taken aback. “How could we treat our people - thoughtful, responsible adults - with such disrespect and distrust?” Chapman, despite the objection of the personnel director, had the time clocks removed from all of their operations. In another plant, he noticed people working in the parts storeroom were fully enclosed in a metal cage. He asked, “What did those people do wrong?” and was told, “Well, we always secure the inventory. It’s the responsible thing to do.” The cage was removed. It wasn’t a document or set of values that made a difference. It was the actions and changes over time. The more that management listened, the more opportunities they discovered to build trust and a sense of shared humanity. As a manufacturing company, there was of course a focus on quality, and they implemented Lean Manufacturing principles. Yet Barry-Wehmiller expanded the focus beyond reducing costs and jobs to improving employee satisfaction and safety. That shift in focus changed the quality initiatives from a threat into an opportunity to contribute. But they had decades of cultural inertia to overcome. Larry, one of their long-time workers, shared his story of how, early in his career, he had an idea for improving things. The CEO asked Steve, an employee in a Green Bay, Wisconsin plant, about what work was like for him. But over time, the approach to work changed - and so did the workers. The changes even rippled outside of work, affecting their home life. The quotes about employees feeling like cogs in a machine reminded me of the quotes from Studs Terkel’s classic, Working, published in 1973. In Out of the Crisis in 1980, Deming railed against common management practices at that time, and argued for giving employees a voice and the opportunity to take pride in their work. Decades later, not much has changed. Perhaps Barry-Wehmiller is just an exception to the rule. Perhaps the gap between where most companies are and where we need to be - in any industry - seems like too big of a leap, so we never take a step. My hope is that Working Out Loud can help get us moving in the right direction. The people in these companies deserve better. We all deserve better. By now, most people are familiar with six degrees of separation, the idea that you are linked to every individual on the planet by a surprisingly small chain of relationships. In an increasingly connected world, it means that information and behaviors can spread quickly via social networks. You would think this would be especially powerful at work, where a smaller population also shares some sense of identity and values. But the opposite seems to be true. Inside companies, there is typically friction and resistance that limits the number of connections and information flow. Why? And what can we do about it? Companies have long recognized this problem, and have exhorted employees to collaborate more and break down silos. But the organization chart naturally creates Us and Them in the company, and all the territorial defensiveness that goes with it. Like Hercule’s Hydra, the oft-lamented silos form and re-form no matter how many attempts are made to reorganize and get rid of them. “Co-creation" is a fairly recent phenomenon. It purposefully “brings different parties together (for instance, a company and a group of customers), in order to jointly produce a mutually valued outcome.” As part of the quality movement, for example, manufacturers worked closely with suppliers to identify and fix issues. Originally, the concept of co-creation was limited to formal arrangements between companies and customers, and later on became common between different companies, divisions, and teams. But it can go far beyond that. Today, co-creation is even easier. Instead of the starting point being an agreement between two organizations, co-creation can begin with contributions from anyone, anywhere, and rely on social networks to deliver relevant information to the people who need it or might find it useful. Co-creation, writ large, thus requires an increase in both the supply and demand of knowledge. More people need to make their work visible - what they’re doing, why they’re doing it, what they’re learning - and more people need to be curious enough to search for, use, and build on the work of others. It’s the opposite of the “Not Invented Here” syndrome. Instead, everyone contributes, and innovations emerge from networks that form across traditional boundaries. Good for your organization. Good for you. Perhaps it’s easy to see why an organization would want such an environment. It would lead to greater innovation as Johnson describes, to reducing the duplication of effort and errors, and to greater agility and resilience in the face of change. That’s why so many companies are investing in culture change programs, in new social intranets, in events to inspire and encourage employees to work and think differently. Although their progress is slow, they are serious in their attempts to improve how people work together. But what’s in it for you as an individual? Why on earth would you share your hard-earned knowledge without knowing what you might get in return? The answer, in short, is that it makes your world bigger. Each contribution you make is like a pebble in a pond, rippling out and bringing you into contact with possibilities you would never know about otherwise. You are only a few degrees away from other people, knowledge, and resources that can help you realize more of your personal potential. But you’ll only realize that potential if you work in a more open, connected way. Co-creation needn’t be a formal program, or something that requires permission from the boss. It’s a choice, a way of working you can start practicing today. What are you waiting for? Note: This post is adapted from an article I wrote for a company’s internal employee magazine earlier this year. Even if you don’t think of yourself as an entrepreneur, you may well be a startup or work with others who qualify for the label. By “startup,” I mean any individual or group that wants to turn an idea into something more than that. Maybe you work in a big company and want to contribute or develop in some new way. Maybe you’re participating in an innovation program of some kind. Or maybe you're looking to do something on your own. A skill you’ll need is the ability to build a purposeful network. Here are two reasons why that skill's important, and one way you can get better at it. For those of you working in large companies, please note that he didn’t write “Innovation comes from the best Powerpoint slides pitched to judges in the innovation program.” You don’t hide your idea until the day of some competition. Instead, as Eric Ries described so well in Lean Startup, you share your ideas and related work early on; you actively solicit feedback that helps you refine and improve upon it; and then you iterate. Along the way, you build relationships with people that can help you in some way, whether it’s with technology, financing, usability, or anything else you might need. That’s how you bring your idea to life. It’s only after you have a viable prototype that you may want to approach people for funding, permission, or other resources - if you need it. The HP Garage, also known as "The Birthplace of Silicon Valley," spawned a myth about innovation that's no longer relevant (if it ever was). Now imagine your idea has been selected or you’ve somehow brought it to the successful prototype stage. At this point you have a different challenge: getting attention. After all, if not enough people know or care about your work, you won’t be able to reach the audience you want to reach, or make the difference you want to make. Today, most successful startups don’t rely on traditional marketing to get attention because it’s too expensive and inefficient. Instead, they try to build communities around their idea. Using the metaphor from Derek Sivers’ popular TED talk, “How to build a movement” (a great way to spend 3 minutes), modern startups actively look to find “their second and third dancers” - early adopters who embrace the idea - by making their offering visible and accessible. Then they equip, empower, and connect those who care about their work to spread the word for them, all the while getting access to valuable feedback, knowledge, and new opportunities. An impassioned tribe, connected to an idea and to each other, has much more power than any lone inventor. Building a purposeful network isn’t just an extra task or a nice thing to have. It’s fundamental to the innovation process. And, importantly, it's a skill anyone can develop. Anyone can have an idea. It takes a network to bring your idea to life, and bring it to the world. As human beings, we’re wired to want control, and self-determination theory describes much of what motivates us. Yet we’ve also evolved a highly sophisticated sense of hierarchy and social status, spending much of our brain activity on calculating how everyone relates to everyone else. The tension between these innate drives is particularly evident at work, where we desperately strive to find our place in the very hierarchy we don’t want submit to, and where we need to cooperate and collaborate to get things done. It’s even more acute (and interesting) when it comes to self-managing teams. Here are some things I’ve learned from observing such teams trying to spread Working Out Loud in their organizations. The spread of WOL Circles in an organization usually begins when someone tries one, tells their friends, and Circles organically multiply. As they spread over a few months, a number of individuals emerge who care about WOL and want to do more. Now what? This is a critical juncture. If these early adopters don’t coalesce, the movement grows slowly or fizzles out as the early adopters move on. But sometimes the individuals tentatively come together to discuss their motivations and aspirations. They start to coordinate the next steps, and the first few seeds become the beginning of a grassroots movement. Critically, leadership comes from contribution, not appointment. The people who care more tend to do more - more organizing, more experimenting, more outreach - and a “co-creation team” forms. It can be fragile, though. Conflicts at this stage, whether due to differences in style or substance, can cause the group (and the movement) to split or disintegrate completely. Somewhat ironically, ego can be the bane of self-management. As the WOL movement in an organization starts to grow, other possibilities and challenges emerge. The opportunities to integrate with existing programs and to scale to more locations and divisions may well require resources and the shifting of priorities. This is another critical juncture. If the co-creation team continues to run without a budget and relies solely on volunteers, the grassroots movement hits some hard limits. Over time, the enthusiasm for the original idea is worn down by the slow pace of change and the bureaucratic resistance of the organization. Instead of trying to fight the way things are, successful co-creation teams leverage them. They shift from being a completely independent group to partnering with HR & other transformation managers responsible for existing programs. They seek executive sponsors for political cover and for resources. The team may still be self-organizing, but they attach themselves to the hierarchy in a way that enables them to make a bigger, more sustainable difference. A different kind of "secure attachment"
A more subtle example of self-management is a WOL Circle itself. Circles are purposefully designed so anyone can start one without budget or permission. The Circle Guides give people some structure, but how and when to do the work is up to the Circle members. They’re self-managing and often (but not always) self-organizing. But how do you get them started? What do you do when a Circle needs help? What if they struggle midway through or someone drops out? The varying responses to supporting Circles reminds me of attachment theory in parenting. Some organizations are completely hands-off. Others insist co-creation team members attend some Circle meetings or involve themselves in fixing issues a Circle may be facing. The results are predictable. Without any help at all, some Circles aren’t as effective as they could be. With too much meddling, the Circle members lose their sense of autonomy and accountability, and start to see their helper as the person responsible for their progress (and issues). The co-creation team suffers too, as they struggle under a growing support burden they created. The best approach is a kind of secure attachment. Circles are left to manage themselves and do the work on their own, but they know they can reach out to someone for support when they really need it. To facilitate this, some organizations are creating networks of certified experts across the company to ensure Circles can readily find trained help if (and only if) they want and need it. Is this revolutionary? No. But it is remarkable that people can drive change using this kind of hybrid approach, combining self-managed initiatives with institutional support. As evidence of this are the results of the HR Excellence awards in Berlin late last week. One of the winning submissions was from a group of eight companies - Audi, BMW, Bosch, Continental, Daimler, Deutsche Bank, Siemens, Telekom - who are spreading Working Out Loud. The recipients were the self-managing teams who, without budget or permission, introduced and spread a movement inside their respective companies. Even more remarkable, they decided to organize themselves into a cross-company community of practice to share innovations that could help everyone accelerate the growth of those movements. Their companies all celebrated their achievement, and several now have board-level support. Yes, people are messy. But given enough space to experiment, enough confidence to resist fighting for status, and enough support to keep going, we can make work more effective and fulfilling than it’s ever been. These people are experiencing the future of work. Now. Usually, discussions about the “future of work” focus on how things will change in years to come. We’ll all self-organize more, for example, and work in networks instead of rigid hierarchies. We’ll find and share information on social networks instead of email and one-way intranets. And so on. A few people, though, aren’t waiting for those programs to be implemented. For them, the future of work is now, and I got to see evidence of that last week in Munich and Erlangen. But after the CEO’s speech, everyone will go back to their desk, surrounded by the same people, systems, and processes from the “legacy” way of working. Some will decide to wait and see if this change passes, like so many before it. For many others, their habits will be so deeply rutted that they won’t have the time or attention to change things. Even if they agree there’s a better way, they’ll be stuck. When people at BMW and Siemens thought Working Out Loud could help their companies change behavior and corporate culture, the prospect of getting management support and changing so many minds and habits seemed daunting. The idea started with a few people and formed a cross-functional team. They didn’t ask for permission or a budget. They tested the idea with small, cheap experiments. Word spread via internal and external social networks. Social networks helped them build a tribe inside the company - and learn from the outside. They used feedback and social proof to get management support. They opportunistically integrated their work into institutional programs to scale the movement. They keep iterating and adapting, influencing more people, and the movement keeps growing. Two companies. Two events. Two milestones. In Munich and Erlangen, what started as grassroots movements began to morph into something else last week. 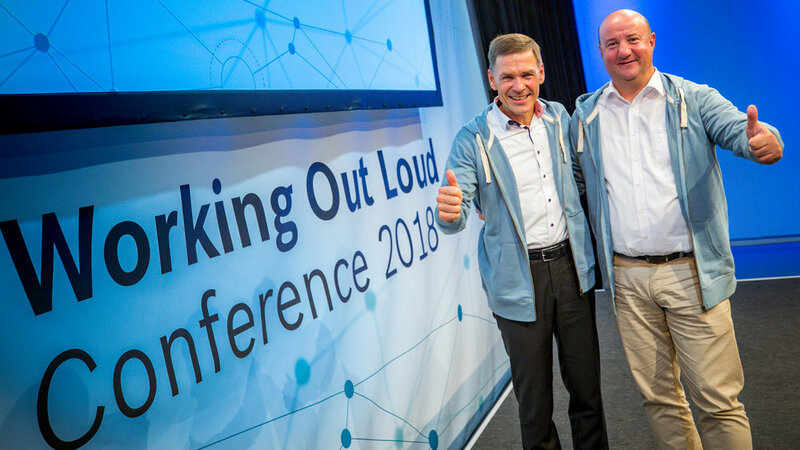 At a BMW event (tagged #BMWWOLCON on Twitter), a board member endorsed the WOL team's work and their growing movement in front of more than 500 people, giving it new authority and importance. This is what the future could be like. 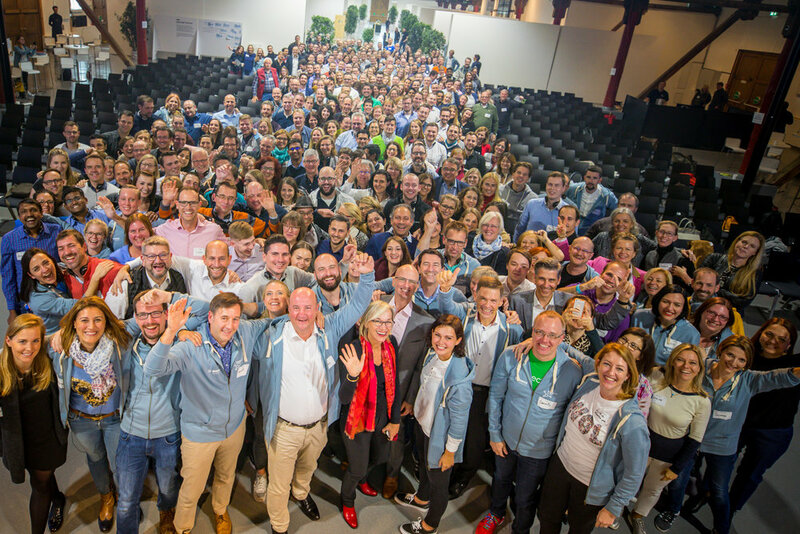 The WOL movements at BMW and Siemens are examples of how good ideas can come from anywhere. Then they spread using elements of agile, lean, and design thinking: experimenting and getting feedback, learning in ways that are low-cost and low-risk, then leveraging the institution for scale when you discover what works in your environment. I’ve seen that same approach at Bosch, Daimler, ZF, and other companies. I’ve seen the same passion & persistence when “work” isn’t just a set of instructions from the boss, but is something powered by people across the company who care deeply about a topic. After these events, someone inevitably volunteers "to spread WOL in my area too.” I think they do it not just because they’re fans of the method, but because they’re hungry for a taste of what work could be like. You can do it too. Try your own Working Out Loud experiment, create a movement within your company, and experience the future of work for yourself. Now. I fell in love with W. Edwards Deming over twenty-five years ago. He was already in his 90s by then, but his philosophy of work and management was only gradually spreading. I felt like I had discovered A Fundamental Truth. But like other Truths, it was inconvenient to people in power, and was ignored or purposefully misinterpreted. So when I saw a recent article titled “Deming, Finally!” I was curious. When I noticed it was co-authored by Celine Schillinger, I made a point to read it carefully, since I greatly respect her work driving change at the pharmaceutical company, Sanofi. “Today, everyone in the manufacturing quality world has read, heard, spoken about Deming. His vision for quality and “14 points of management” as well as the “System of Profound Knowledge” in particular are inescapable reference points. However, Pharma may have got this all wrong for the last 30 years. By focusing on processes, control and exhortations, manufacturers have missed the essence of Deming’s message. The missing piece in most quality programs is the human being. Deming understood that and most of the elements of “the Future of Work” decades ago, but he wasn’t really heard. Deming would have benefited from better communications & behavior change methods, and I think Working Out Loud Circles can help with both - whether it’s work in an office or in manufacturing plants, in hospitals or schools. I’ll offer some specific suggestions in an upcoming post. In the meantime, read Celine’s article if you can, and let me know what you think about the topic. How would you make quality and continuous improvement more human?